Distributor: Currently licensed by Nippon Ichi Software America, but also available on Crunchyroll..
Notes: As of the 31th of December 2006, Geneon has lost the license to this show. 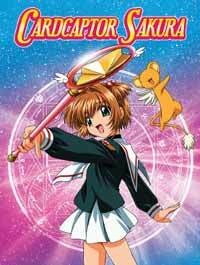 I'll say this as straight and firm as possible: I am a big Card Captor Sakura fan. Easily one of the best shows I've seen from Japan so far and one of the best animated shows I've seen worldwide (though I have seen very few shows do better). First off, we have a plot. The plot is simple to understand at first, and moves onto other backstories in a rather smooth manner. It's somewhat neat to see how the backstory is constructed as well as the main plot even without as much time to be built as the main plot is. You start the plot off with being introduced to Sakura and showing a day in her life...the last typical day, then the plot begins to strengthen when she finds the Clow Book and releases the cards. From when she first meets Cerberus onward, the plot plays in both a typical (each episode featuring a different event and a different card, sometimes two and in one or two cases so far, none) and an atypical way (keeping a plot running throughout the episodes). One of my favorite parts of CCS are the characters. The main character (Sakura), is an elementary school student with a cheerful personality despite the huge responsibility she has to bear (the fact that she can shoulder this and still have fun is one of my favorite parts about her). When she isn't out sealing a card, she's leading a fairly mundane life, doing chores, partaking in school activities, etc. Cerberus (aka Kero-chan) is the all-too-cute (aka kawaii) guardian of the seal. After his awakening, he finds a new calling in video games. Kero-chan, keeping to his cute theme, is a sweet-tooth and will down any nearby sweet food in due time. In Sakura's family, she has her brother Touya (a caring older brother who also plays around with Sakura, calling her a "monster" when he can) and her father Fujitaka (an archaeological professor at a college). Sakura does have a mother (Nadeshiko), but she passed away before the events of the anime. At school, Sakura has quite a few friends, including Rika (a girl with a rather large crush on her teacher Yoshiyuki), Naoko (an avid reader who loves fantasies and scary stories), Chiharu (the friend of Yamazaki, who she has known since kindergarten), and Yamazaki (Chiharu's friend and a fabricator of many false stories, some of which have people fall for it). The most noteworthy of Sakura's friends are Tomoyo Daidouji (the only one of Sakura's friends that knows about her magical abilities), the best friend who, while not taking a big part in the card scenes, is always behind Sakura, filming her captures (when she is able) and designing her memorable costumes and Yukito, the classmate of her brother who Sakura has an huge crush on. Later in the series, Syaoran Li is introduced. At first he acts as an antagonist, but soon loses this attitude and becomes Sakura's ally (all while developing a love interest with her). Shortly afterward, his fiancee Meilin is introduced. It can safely be said that Meilin is more competitive against Sakura than Syaoran, but like Syaoran himself, this rival attitude ends later in the series. There are many more characters, but if I were to describe all of them, we'd be here til dawn two days after. As a side note, I may look like I'm giving too much attention to Sakura, but this doesn't mean I don't like all the characters (Rika, Tomoyo, and Kero-chan are personal favorites). Now let's focus on the music. There is no doubt in my mind that the first season's opening (Catch You Catch Me) and closing (Groovy) are on my favorite songs list. Both are cheerful and joyous songs that convey the cuteness of the show to a good degree and add to the mixture, plus they are coupled with two fairly good segments (I can very easily describe the ending as it has Kero-chan skipping on a globe with a very joyful expression, but the opening is slightly harder to describe, but features Sakura basically in a "dreamland"-like state, skipping around thinking about things). For the in-animation soundtrack, it has a fairly well-placed feel in the scenes where it counts, giving off these cute/epic vibes that makes me wish for more. Artwork? I love it. The environments are lively and colorful and gives the anime a kind of freshness that makes it look recent despite its age. The characters are well done and have beautiful detail, the locations are fairly crisp. Fortunately for it, the animation is just as well done. The action scenes move along at a steady pace with little if not any breaking down. Outside of action scenes, the scenes move along like liquid: smooth, quickly, and without mess. And finally, to end the main section of the review, some analysis on the seiyuu. The seiyuu for this show are actually well chosen. Sakura has a fairly bubbly voice that contributes to the cuteness factor, as does Tomoyo's, but the series does help counterbalance the cuteness with serious voices, such as Sonomi (Tomoyo's mother who has a bone to pick with Fukitaka) and Fukitaka himself. In closing, I wish to say that VERY few things can waver my support for this series, and if they did, I'd still be a big fan. This is hands down one of my all time favorites series, ranking up there with Azumanga Daioh and Ah! My Goddess. In short, I love it.